Our phones are like our purses. We have all of our dear information in there. Every time someone lets me look at their phone and their applications, I feel guilty – like I’m looking through someone’s belongings, like I’m looking through someone’s purse! So I thought, this could make a fun post – Android is a lot different than an iPhone in terms of how the applications are shown. In the Android, you can set up your main pages that hold the apps you use the most often. Everything else can be accessed through a list of applications. You don’t really see those unless you specifically navigate there though. For all someone would know, the few apps that are featured on the main screens are the only apps I have on my phone! Even though I don’t really let people use my phone, I like this feature that the Android has. Not only is the more visually appealing and organized, you are able to add fun widgets to the screen to make your viewing experience even more fun. Screen number 1, 2, and 3. I usually start at screen number 2 because that’s the screen that has the time on it, then screen 1 and I don’t look at screen 3 that often unless I want to access a specific app on it. For some time, Feedly widget has not been working properly so I’m debating on deleting it. Thoughts? 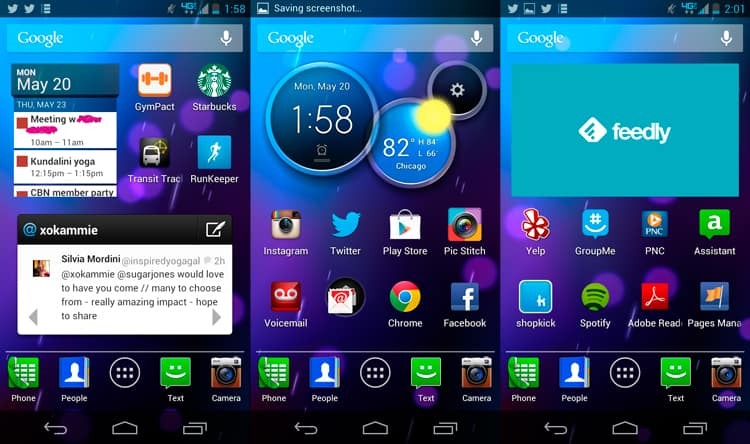 What are some of your favorite smartphone apps? Disclosure: I am participating in the Verizon Health and Fitness Voices program and have been provided with a wireless device and six months of service in exchange for my honest opinions about the product. I love Pinterest (addicted), Lift – an app that lets you set daily goals and then check into them, Etsy, Ebay, Instagram, pretty much all the usual apps. Another one is a Tabata app that counts 20 secs on and 10 secs off for 4 minute rounds. I love AllRecipes.com Dinner Spinner. The app can randomly choose something for you, or you can select the main ingredient (chicken, seafood, etc. ), dish type (like main dish, side dish, etc. ), and amount of time to prepare (20 minutes, etc.). Then the app pulls up a bunch of recipes from which you can select to make for dinner. Most importantly, it is free. I think we have the same phone, haha. 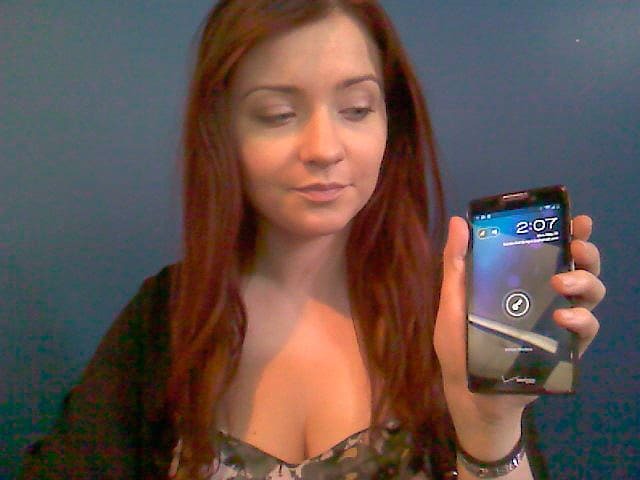 Though, mine is a RAZR MAXX HD and I can’t tell if it’s exactly the same as mine. ANYWAY! I love the Android widgets and apps, they keep me entertained throughout the day. Some of my favorite apps are the social media apps (of course) and also Hootsuite, which lets me schedule social media posts. I also use Feedly and it’s been working fine for me, so maybe you could try uninstalling and reinstalling it to give it a kick. Probably one of my favorite apps though is my Netflix app since I’m a huge movie buff and with my battery, it’s no problem watching an entire movie on my phone. I see some interesting looking apps on your images that I may have to check out. Thanks for sharing your screen!! Definitely! I’m going to share more apps I think eventually but I am still on a search for more things to add. I DO love Netflix but I usually watch it on my iPad – bigger screen 😉 I’m obsessed with How I Met Your Mother right now. And I do think MAXX looks VERY similar to the one I have. Not sure what the difference is, exactly. Oh well. I’m so bad with downloading apps on my phone! I think the only ones I have are like twitter and instagram. …oh and sudoku. I swear I’m not an old lady;) Oops-y. I love the look of that phone! Definitely visually appealing! Haha Sudoku doesn’t make you an old lady… I play bingo ALL the time. Now that’s an old lady game! haha now where’s my cane? !